In recent years, social travel networks have become increasing popular, largely thanks to a rising interest in experimental and responsible tourism. Travelers are looking for new ways to engage with local communities and delve into the heart of a country’s culture. Doing a homestay in Mekong Delta is absolutely enjoyable and memorable. You may share joys and maybe hardship with local hosts. Needless to say, this is the best way to get to see the Mekong Delta through the eyes of a local and understand how they live their daily lives. The experience you will be making is totally worth it, so the best is to just go with the flow and make the most of everything. Jardin du Mekong provides you a priceless chance to communicate across culture in a friendly atmosphere. 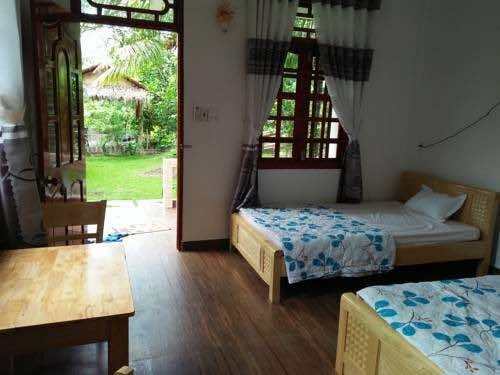 It’s a small nature cozy homestay with a common house and five bungalows. All structures have been constructed using materials from the island, driven by our respect for the environment to justify many choices. They have built in the countryside, there is no hot water, no A/C and no TV. 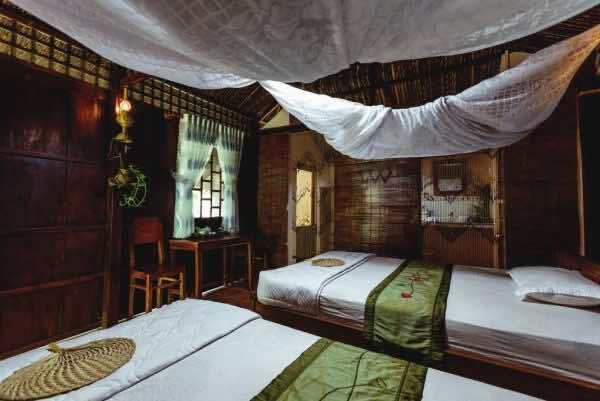 All the rooms are opened enough to allow air flow, furnished with fans, wooden furniture locally made and mosquito nets. There are some exciting activities that guests can experience like cycling, fishing, and enjoying the traditional cuisine of the Mekong area at Jardin restaurant. Address: Song Doc Bridge, Hoa Nghia Commune, Cho Lach District, Ben Tre Province. As the name says, this place offers river views having small boats and fishermen glide by during the early morning hours. If you would like to discover the area, cycling and fishing are possible in the surroundings. 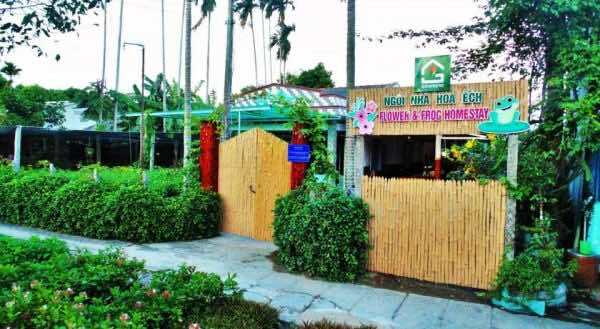 At Quoc Phuong Riverside Homestay, you will find a restaurant serving American, Australian and Asian cuisine, as well as local delicacies. A simple room are fully furnished to ensure you have a good night’s sleep. Address: 293, Group 17, Phu Xuan Hamlet, Phu Tuc, Chau Thanh, Ben Tre. 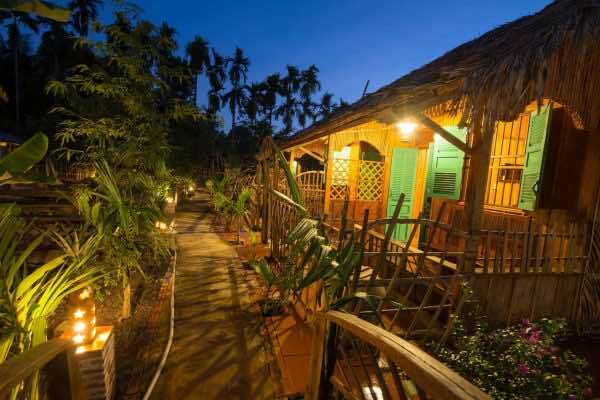 Mekong Rustic Homestay stands beside the Cai Be Floating Market, on one of the beautiful islands in the Mekong River. The rooms are set in a lush fruit garden, emphasizing the beauty but seldom visited rural area in this side of the Mekong River. Experience true Mekong Vietnamese hospitality where it is important that you feel welcomed and included. The accommodation is provided in seven standard rooms with basic facilities. Included is a delicious breakfast. Come and experience life here with friendly local people and a wealth of activities including cooking, gardening, fishing farming and cycling. Address: Tan Thien Hamlet, Tan Phong Commune, Cai Lay District, Tien Giang Province. Immerse yourself in the magic of remote rural Vietnam, Happy Farm Homestay is a traditional style accommodation with the idyllic surroundings of rice paddies and the fruit gardens in the Mekong Delta of the southern Vietnam. It is the ideal base for wild adventures as learning and rising the horses, or simply take time to experience local village or chill out in a hammock by the Mekong River. 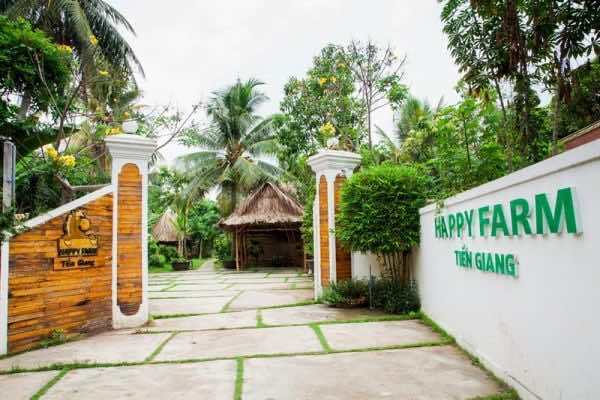 There are private double and twin rooms and family rooms, all with newly renovated private bathrooms, with some rooms adjacent to the side of Mekong river and others overlooking the surrounding rice fields and fruit gardens. Address: 35 Bo Xe Village, Thanh Phu Ward, Chau Thanh District, Tien Giang Province. This homestay located in the village center Sa Dec old flowers. To get to town or explore the flower market and the nearby countryside, you can rent a bicycle from the hosts and enjoy your own way. The owner offers a delicious homecooked dinner of local specialties and free light breakfast in the morning. Address: Tan Quy Dong Village, Sa Dec, Dong Thap Province. 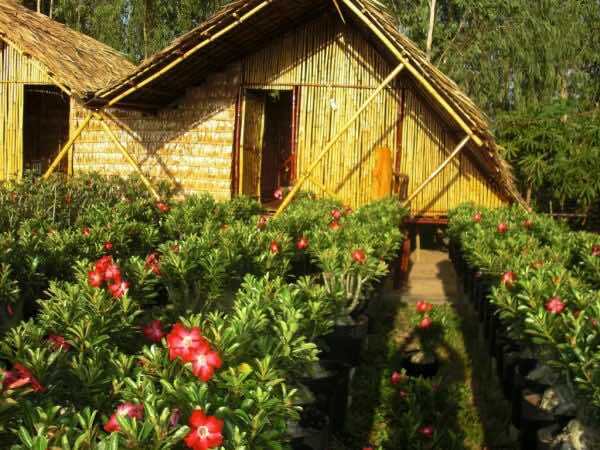 This homestay is made up of several bamboo bungalows offering rooms for couples and families. Certain rooms have a seating area where you can relax and have views of garden. Address: 103/2 Khanh Hoa Hamlet, Tan Khanh Dong Commune, Sa Dec, Dong Thap Province. While you join a trip to Vinh Long, one of the homestays in Mekong Delta you are recommended to is Ba Linh Homestay with small bungalows. You can feely relax in a hammock to read books, listen to music, and relish the idyllic atmosphere. It is true to say that you will immerse into the life of locals by cooking a dinner with them and talk to them about everything because the host can speak English well. If wishing go around, just borrow bicycles and enjoy a relaxing ride along village paths. Address: 112/8 An Thanh, An Binh, Long Ho, Vinh Long Province. Located in a non-touristic village and surrounded by Mekong canals, this homestay’s views allow you to stay away from the usual city stuff and experience the pure and peaceful life in Mekong Delta. 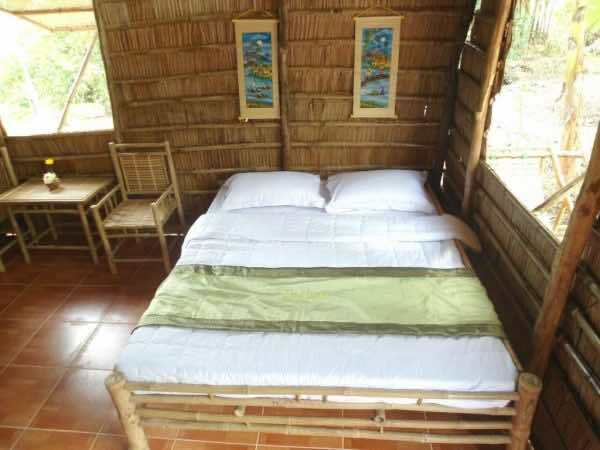 The simple room offers an enjoyable stay for guests as they are in a simple brown bamboo hut whose outside is cool and relaxing space of green bamboos and other trees. The homestay also provides with rental bicycle for free in order that the guests can discover the area by themselves. The minibar and house restaurant are where to relax and enjoy Vietnamese culinary delights. Address: Xeo Tre, Khanh Binh Area, Phu Thu Ward, Cai Rang District, Can Tho Province. 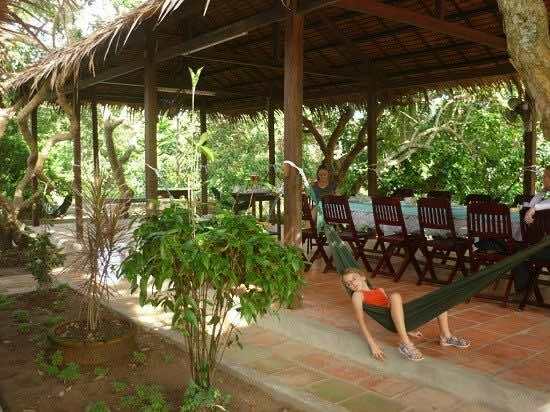 Located by a river, Minh Viet Homestay provides a relaxing getaway in Can Tho. You can ask the owner to bring you a private tour on the river if you wish as he is always pleased to do that. 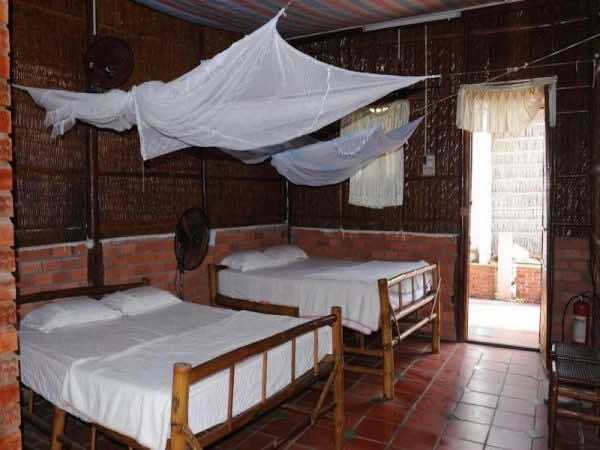 The rooms are fitted with simple beds and mosquito nets. Views of the garden can be enjoyed from all rooms. The all-day dining restaurant serve delicious Vietnamese food. Address: 245/1 Phu Quoi, THuong Thanh, Cai Rang District, Can Tho Province. Hopefully, this list of the most amazing homestays in Mekong Delta will be come in handy when you’re having a plan to travel to Mekong Delta in Vietnam! >>> If you want to Explore Mekong Delta in 1 or 2 days, I will recommend you to book a tour at any tour operators( KIM TRAVEL). It will be easier and smoother because they make all travel arrangements for you. Also, they can tailor a tour to meet your need in terms of your schedule, your budget and your travel style.